When the invocation and the Pledge of Allegiance are among the two longest items at a Bridgeport City Council meeting, one can assume the meeting was a short one. And such was the case Monday evening. In roughly 10 minutes, Council wrapped up the regular portion of their agenda. After that, the city’s governing body went into executive session and Mayor Andy Lang said there would be no action taken once they returned to regular session before adjourning. After Pastor Jeff Parsons of the Family of God Baptist Church provided the invocation and the pledge was given, the only official item on the agenda was addressed. That came after Lang did not have a report and City Manager Kim Haws also did not have a report to present to Council. In relatively short order, Council approved a 10 percent contingency fee of $359,367.50 for the grading work for the future Bridgeport Indoor Recreation Complex. Typically, a contingency fee is approved for projects at the same time as a contractor’s bid is approved. That didn’t happen. At City Council’s July 11 meeting, Green River was the responsible low bidder for the earthwork of the new indoor recreation complex off of State Route 131 (Benedum Drive). The bid Council unanimously awarded during the last meeting was for $3,593,675. However, the contingency was not included. The only issue brought up was by Council member Robert “Bob” Greer who asked City Attorney Dean Ramsey if it was better to approve the contingency fee separate or make a motion to approve the bid and the contingency fee together. After Ramsey explained it was fine to proceed as presented, the matter was approved unanimously in short order. After a few comments on other matters by Greer and Council member John Wilson, the group voted to go into executive session. Council has been meeting regularly in executive session for months, usually discussing advance construction planning on the indoor recreation complex. 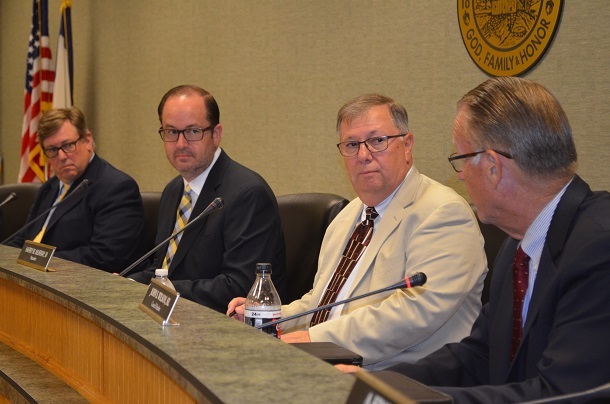 Editor's Note: Top photo shows Council member John Wilson, far right, briefly bringing up a subject as members, from left, Council member Bob Greer, Mayor Andy Lang and City Recorder Hank Murray listen. 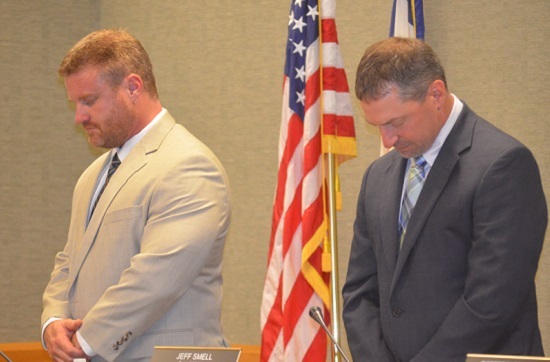 Bottom photo shows, Council members Dustin Vincent, left, and Jeff Smell bowing their heads during the invocation.